Fiordland is a great place to live and work. Many of the jobs are in tourism, but there are other industries here such as farming and lobster export, teaching and service industries such as banking, building, and retail. The Fiordland Employment website lists jobs in the community. Also check out the Fiordland Advocate job pages. Jobs in Fiordland in the tourism sector are often seasonal (summer months only), but there are many benefits. You may find yourself working on a boat in one of our fiords, or working in one of our fabulous restaurants. Be the envy of tourists and stay a whole season in a magical paradise that visitors only get to see for a few days. Buying and renting property in Te Anau and Manapouri is easy. We have plenty of professional real estate agents ready to help you, many specialising in both rental and purchase. The options are numerous. You can either live in town, or on a lifestyle block on the fringes of our towns, or further out in the countryside. Many people choose to buy an existing home, but many others choose to build on an empty plot. There are also farms for sale; PGG Wrightson is a rural real estate agent specialising in all types of property sale including farms. 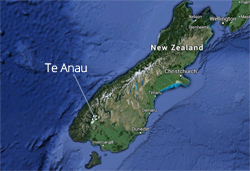 A great idea if moving to Te Anau or Manapouri is to rent a house for a while and take your time looking for the perfect location for your permanent home. Take your time making the decision, because once you've settled here, you'll probably want to stay forever! PGG Wrightson Real Estate is one of New Zealand's largest single full-service real estate companies, offering a comprehensive selection of rural, lifestyle, rural residential, commercial and industrial property throughout New Zealand and Australia. Whether you are looking to purchase or market any property, PGG Wrightson Real Estate can help you achieve the outcome you require. Go to PGG Wrightson.